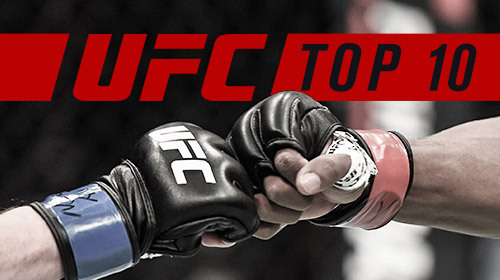 UFC Top 10 is the ultimate countdown for action packed moments in UFC history. From thrilling momentum shifts to unexpected knockouts and submissions, it's edge-of-your-seat action -- all relived by the fighters, coaches and commentators who were involved... or just along for the ride. UFC Top 10 Slugfests Aug 3, 2018 (22:00) "UFC Top 10: Slugfests” counts down the top 10 slugfests in UFC history, as told by UFC fighters, Hall of Famers, coaches and the fighters themselves. UFC Top 10 Personalities Jul 23, 2018 (22:00) "UFC Top 10 Personalities" breaks down the ten most entertaining characters in UFC history. Conor McGregor, Joe Rogan, Nate Diaz, Rampage Jackson and other standouts come alive when the cameras start to roll. In this episode, UFC fighters and commentators analyze these memorable personalities and show why they are fan favorites... or villains. UFC Top 10 Submission Artists May 18, 2018 (22:00) UFC Top 10 Submission Artists enumerates the 10 most devastating submission experts in UFC history. Fighters like Joe Lauzon, Fabricio Werdum and other superstars have fans thinking tapout each time they enter the Octagon. In this episode, UFC legends break down these memorable submission artists as well as their lasting impressions on the sport. UFC Top 10 TUF Alumni Apr 18, 2018 (22:00) "UFC Top 10: TUF Alumni" counts down the top 10 fighters to come off the UFC reality show, The Ultimate Fighter. UFC Top 10 Title Reigns Sep 25, 2017 (21:59) "UFC Top 10: Title Reigns” ranks the ten greatest champion reigns in UFC history. Relive the runs of the top title holders as told exclusively by the UFC fighters, Hall of Famers, and coaches. UFC Top 10 Knockout Artists May 1, 2017 (22:05) "UFC Top 10: Knockout Artists” ranks the 10 most feared heavy hitters in UFC history. From thrilling momentum shifts to unexpected knockouts, it's edge-of-your-seat action -- all relived by the fighters, coaches and commentators who were involved... or just along for the ride. UFC Top 10 Feuds May 9, 2017 (21:58) "UFC Top 10: Feuds” ranks the 10 most action-packed rivalries in UFC history - all relived by the fighters, coaches and commentators who were involved... or just along for the ride. UFC Top 10 One Round Wars Jun 7, 2017 (23:52) UFC Top 10: One-Round Wars” ranks the 10 most action-packed opening frames in UFC history. From thrilling momentum shifts to unexpected knockouts and submissions, it's edge-of-your-seat action -- all relived by the fighters, coaches and commentators who were involved... or just along for the ride. UFC Top 10 Upsets Aug 29, 2017 (21:57) UFC Top 10: Upsets” ranks the ten greatest upsets in UFC history. Relive the most shocking upsets told exclusively by the UFC fighters, Hall of Famers, and coaches. UFC Top 10 European Fighters Oct 26, 2017 (22:00) "UFC Top 10: European Fighters” ranks the 10 best fighters hailing from Europe. Look back on the greatest moments from the careers of Europe's elite fighters, past and present. Told exclusively by the most popular UFC fighters, Hall of Famers, coaches and the fighters themselves.